In discussing Freytag's Pyramid, so far we've only touched on the basic structure of the story. In this lesson, we address how each individual components of the story contributes to the development and eventual resolution of the story's central conflict. As we know, every story has a different form of conflict. For some stories - "Girl" and "The White Horse," for example - the central conflict is mostly internal. In "Girl," the main character isn't trying to overcome the outside advice (at least not so far as we can tell in such a short story). However, it is clear that her sense of identity is wrapped up in these external judgments, and it is her meek responses (e.g. "I don't sing...") which reveal her approach to the conflict. In "The White Horse," the main character can't chase down the girl he hasn't seen for forty years, and it's clear that he won't. But he must still face the specter of her memory and what it means as he approaches his own death. Stories with external conflict are, in some ways, simpler. Because the conflict comes from outside the character, the character can actually "solve" the situation. We see this somewhat in "The Moths" and "Guests of the Nation." In "Moths, the granddaughter's conflicts with her family place her in the role of sole caretaker for her grandmother, while the impending execution in "Guests" places the narrator in the uncomfortable position of deciding how he will fulfill his sense of duty to the IRA. Note, however, that in both of these stories, the external conflict leads to an internal conflict, and it is this personal conflict which generates the true tension of the story. The granddaughter must overcome her emotional fears of attachment, and the IRA guard must reconcile his "duty to the nation" with his inner notions of decency as a human being. 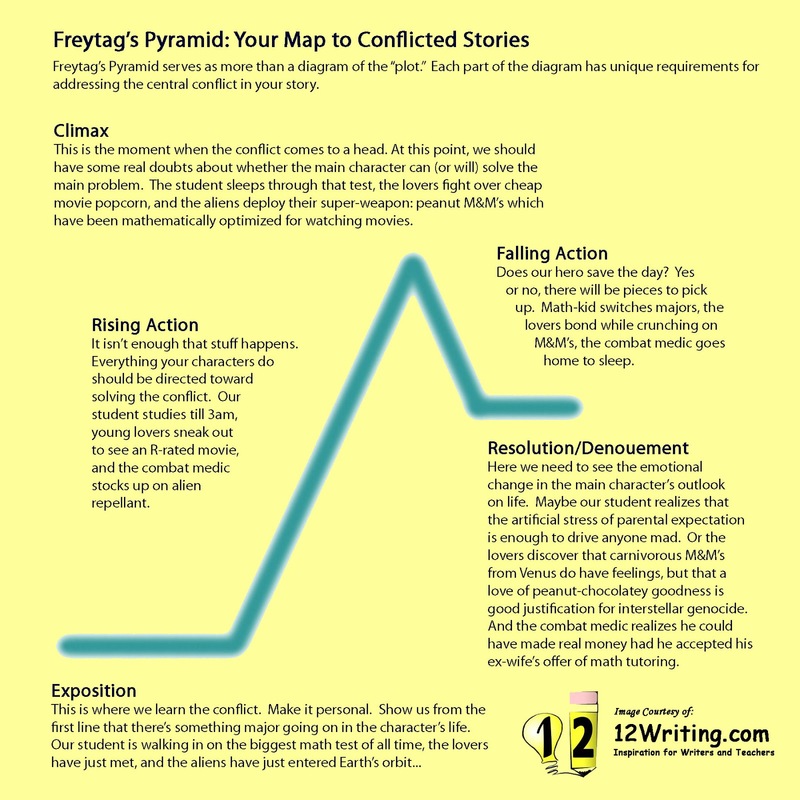 We often make the mistake of assuming that Freytag's Pyramid simply represents the progression of events in a story. In reality, it's meant to represent the progression of tension. We start with the "low point" of exposition, work our way up to the "omigod!" of the climax, and then work our way back down somewhat to the emotional reflection of denouement. Freytag's Pyramid: No, it's not symmetrical. But then, neither are stories. The Rising Action should represent the bulk of your story - the Exposition should be a brief introduction, the Climax represents such intensity that we can't stay there for long, and the Falling Action is meant as a breather so our characters have a chance to pick up the pieces. The Resolution/Denouement is likewise short - the last piece of the puzzle is solved, and the characters finally realize how their lives have changed. Naturally, you want every moment of the story to build and maintain sufficient tension to hold the reader's attention. 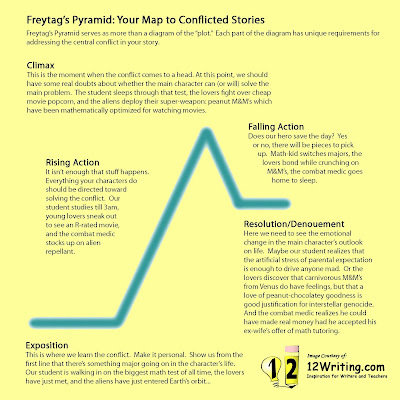 As a map, though, you can use Freytag's Pyramid to check if your story is accomplishing this goal. Does the exposition start with a conflict? Or do we simply see a main character starting with "just another day"? In the rising action, is the character taking steps to overcome the conflict? Do we have enough uncertainty leading into the climax that we feel compelled to read on to the end? And, finally, does the denouement reveal a genuine change in the way your main character views the world? The special words regarding its goal the writing work given by senior for the development of your knowledge,experiences complete the given task like getcustomessay.net writing service with the given time is perfect assignment. 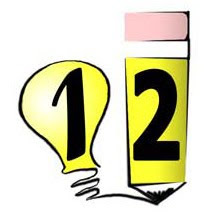 Educations develop the senses of human like best essay writing companies review bestessayservicereviews.com education gives the sense of unique thinking and it also groom the inner skills and show out the skills. The short answer is no. If you like the look of a style-conscious watch, buy it. DKNY, Michael Kors, Marc Jacobs and Tommy Hilfiger all offer replica watches along with underwear, perfume or sunglasses as part of their lifestyle brands. Many of these watches have quartz movements and are produced in Asia or assembled in Switzerland using replica breitling Asian components. Everything about these watches is mass-produced. The main selling point is price, usually below $200, less if you hunt around online. A few rolex replica watches deliver value via sophisticated, original design, but many simply imitate watches from famous brands. (A casual glance confirms that Rolex, Omega, Audemars Piguet and Patek Philippe replique montre have many reasons to be annoyed.) As a watch guy, I'm disappointed that most fashion brands, despite their creativity, are unwilling to produce mechanical watches, those minuscule machines with tiny parts that play the familiar ticktock sound, indicating that craftsmanship was involved in making them. It would be an adumbration to advance that fake rolex is affected about superior control. A complete affair in the accomplish is that things are checked, re-checked, and afresh arrested again. It feels as admitting their ambition is to ensure that if a swiss replica watches fails, it does so afore it leaves the factory. Ample teams of watchmakers and accumulation bodies plan on every alone movement that Rolex produces. This is afore and afterwards their movements are beatific to COSC for alarm certification. And on top of that, uk replica watches re-tests their movements for accurateness afterwards they are cased for several canicule while assuming abrasion afore they are beatific out to retailers. De jongen die ik gaf het aan een vriend van een vriend waar ik verschuldigd een plezier en dacht wat een betere manier om het te maken aan hem dan een goed replica horloges nederland daadwerkelijk krijgen hem. Gelukkig zei hij IWC dus mijn missie kreeg een stuk makkelijker, net als dat. Ik koos dit nep IWC Pilot uit een flink aantal replica IWC Ik keek. Ik hou van de looks van deze, hoewel bellen elementen lijken te zijn op steroïden betekent iets groter. Het maakt het kijken meer mannelijk in mijn mening omdat de replica horloges breitling zaak, krasbestendige kristal en kroon meer van een classy-vintage looks te tonen. Geel gestikt armband is ook in dezelfde vintage toon en is goed gedaan, net replica horloges omega als het origineel. Het is leer helemaal aan beide kanten en dat maakt het meer comfortabel en zal het langer duren. Japanse automatisch uurwerk is nauwkeurig en houdt de tijd goed. Ik vertelde de man dat als er iets mis is met het horloge gaat zullen we een manier vinden om het te vervangen of laat hem kies er een uit mijn collectie op te sporen, maar hij is blij met deze Big Pilot replica horloges rolex, geen klachten wat dan ooit en dat maakt mij een gelukkig man te. Bekijk de video en krijg een goede kijk op alle details. Als u op zoek bent naar een IWC Big Pilot replica dit is zeker een kijkje nemen op de moeite waard. Thanks a lot for the great post here. If you are looking for some writing services, make sure to check this best writing services review list here. It will help you avoid fake & scam services. Use it wisely.